Mark XI Airborne Depth Charge in service 1942 (An improved Mark VIII with a concave nose to reduce ricochets). The above is the depth charge rack on the Sunderland at the RAF Museum, Hendon. I haven't got the details of exactly what is carried on it. There were a variety of munitions carried by Sunderlands. 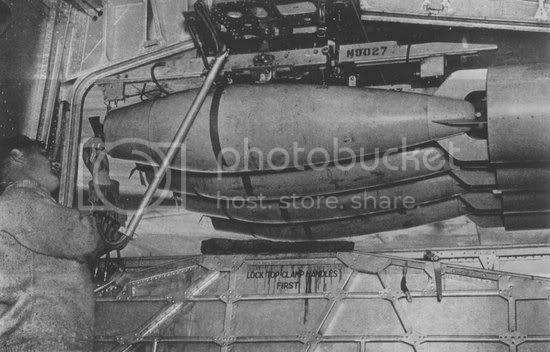 The original 100lb anti-submarine bomb proved to be ineffective (especially after an Anson scored a direct hit on an RN submarine which reported no damage!). The depth charges were basically conversions of naval depth charges and IIRC came in both 250lb and 450lb varieties. I've got some detailed notes but not to hand right now - more later unless somebody beats me to it. I've just spotted, in your photo above, the serial N9027 on the bomb rack. If it is Sunderland N9027 then she sank at Gibralter in a gale in April 1941. Which puts a question mark over the caption. They could be anti-submarine bombs?? There were two types of AS bombs - 100lb and 250lb. which is this photo. Big thing the 450lb isn't it?